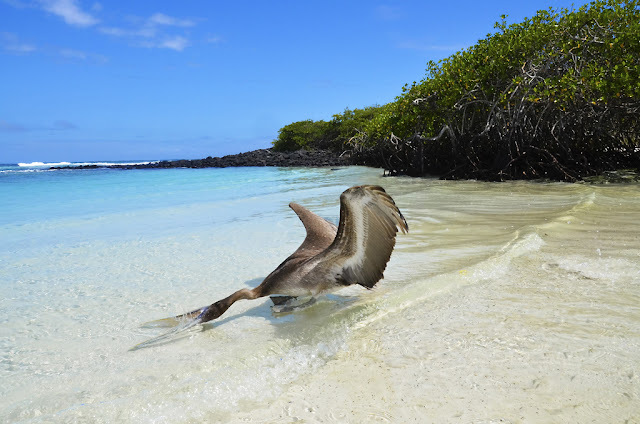 In this 5-day Galapagos tour we offer a walk through the Santa Cruz Islands, Bartolome, Seymour, Plazas and Isabela, in which you will look closely at the amazing life of the islands, while sailing the waters of the Pacific, snorkeling, walking or simply beachfront stops to be astonished by the wonder you have before your eyes. From the airport of Guayaquil, we depart to Baltra Island. Upon arrival, we meet the entry requirements: pay the entrance to the National Park and spend the baggage for a review, which will be verified that no plant or animal was introduced. Our guide will welcome us, you will board a bus, transfer to Itabaca channel, where we will take a boat to cross the channel to the Santa Cruz island. On the other side, a bus will be waiting for us to move to Puerto Ayora. We will visit the reservation "El Chato", at the top of the Santa Cruz island . Here we have the opportunity to observe giant tortoises and the vegetation in this area. Departure: Bus, 6:00. The trip lasts 40 minutes by bus from the hotel to the channel Itabaca, where we board a boat for a trip of 1 hour at Bartolome. We start with a breakfast on the ship during the trip to the island and a brief introductory talk by a certified bilingual guide. On the arrival at Bartholome, we will make a landing and walk 40 minutes to the summit of the island, from where we enjoy a spectacular view and take panoramic pictures of the surrounding islands. The trail leads us through a landscape of lava that shows the origin of the archipelago. After the walk, on the boat we serve lunch and refreshments. After lunch, we will make snorkel in a small sandy covered beach, where we will observe Galapagos penguins, numerous varieties of colorful reef fish, sea turtles and several stripes. During the trip back to the Itabaca channel , we take a light snack. Arriving in Santa Cruz, the bus will take us back to the hotel. Departure: 08:00. The trip lasts 40 minutes by bus from the hotel to the channel Itabaca, where we board a boat for a trip of 20 minutes at North Seymour Island. The tour begins with a guided tour along a path of about 2.5 km, through iguanas nesting sites, and one of the largest colonies of frigate birds, blue-footed boobies. We will also see sea lions, land and marine iguanas, lava lizards and pelicans. At the end of the walk on land we will go back to the boat for a hot lunch and refreshments, before traveling to "Las Bachas" beach on the north coast of Santa Cruz Island for snorkeling or take a relaxing stroll along the beach. During the snorkeling we will see many colorful reef fish, rays, sharks and turtles. Return: 16:00 approximately, depending on sea conditions. Departure: 08:00. The trip lasts 40 minutes by bus and 30 minutes by boat to the Plazas island. Once on the island, we will follow a path through a forest of cactus, some of which reach heights of 10 meters (32, 8 feet). In this forest sometimes is difficult to walk because of the large amount of land iguanas that inhabit the island and feed on cactus flowers. Walking through a path of 10 km (6,2 miles) along the top of the cliff, we will observe colonies of sea lions, and nests of swallow-tailed gulls and other species. This is an excellent point to take pictures of a variety of seabirds. Lunch is served on the boat before returning to Punta Carrion, near the Itabaca channel, where we will snorkeling with sea lions and sharks. Return: Approximately 16:30, depending on sea conditions. After breakfast at the hotel, we walk to Tortuga Bay beach, where we will stay all morning. Here we will observe numerous marine iguanas resting on the sand, and enjoy a delicious climate and spectacular landscapes. In addition, at this beach you can do snorkeling. Return to hotel and lunch. At 14:00 we will go by speedboat to the Isabela island. Arriving in Isabela, we will go to "Casa de Marita" and then take a bike to explore the mangroves and the Wall of Tears, which was built by prisoners when Isabela was a penal colony. During the trip we will see iguanas and tortoises. During the morning we visit the highlands of Isabela where we will ascend the Sierra Negra volcano, the caldera is the world's second largest of its kind and offers breathtaking scenery. Then we continue walking to the Chico volcano. In the afternoon, visit the The Tintoreras islet to see reef sharks white tip, little penguins, blue-footed boobies, iguanas and other species. Then we return to the hotel. In the morning (06:00) will take the boat back from Isabela to Santa Cruz. Santa Cruz will visit the Charles Darwin Station, where many studies have been conducted for conservation of the different species of turtles in Galapagos. Then we will move from Santa Cruz to Baltra Airport to take the flight back home.